To go live to your preferred site, you will need to first set it up as an output on XSplit Broadcaster. For platforms like Twitch, Facebook Live, Mixer and YouTube Live, it’s as easy as logging in. Twitch is a live streaming video platform primarily focuses on video game live streaming, including broadcasts of eSports competitions, creative content, "in real life" streams, music broadcasts and personal streams from the top gaming personalities. Reach new audiences in new ways. People love watching video, which is why we’ve built a dedicated place to watch this engaging content on Facebook. While your current fans will be able to keep up here and in News Feed, the experience will help new followers discover you too. The world’s largest online video sharing site now offers live broadcasting for YouTubers in good standing. Mixer is a next-generation live streaming platform for gamers that offers viewers real-time influence and participation in live game streams and engage with the content directly. Features can be integrated into games to allow users to affect gameplay or vote on elements using buttons displayed alongside the stream. Go to Broadcast > Set up a new output, then click Twitch. Click Authorize and sign with the Twitch account you want to stream to and then click Next. After authorizing, you'll go through a setup wizard to determine the best ingest server, connection speed and resolution. Click Finish once it's done. The Twitch Properties window will be shown, if you wish to customize your stream settings. Note that the Setup Wizard will have automatically set recommended values here already. Go to Broadcast and click the Twitch profile you have set to go LIVE. Go to Broadcast > Set up a new output, then click Facebook. If you are logged in with Facebook in XSplit Broadcaster, your account will already be automatically authenticated. Otherwise, click Authorize and sign in with your Facebook account that you want to stream to and Approve any permissions XSplit is requesting. The Facebook Live Properties window will be shown again, if you wish to customize your stream settings. Go to Broadcast and click the Facebook Live profile you have set. You will be prompted to input your livestream details. Choose whether to go live with a New Video, select an existing Scheduled Video or resume a Continuous Live Video. Sets a title for the video. Must be less than 255 characters. Add text that will appear on the Facebook post for your stream. Adds content tags that will make your video more discoverable. They are not visible to the public. Tag the video game you're playing for Facebook Gaming. Adds the location where you are streaming from. Choose whether your livestream is visible to the public, your friends only or only yourself. Checking this allows you to stream more than 4 hours but will not generate a recording of your stream on Facebook. Before you get started, you will need to enable YouTube Live streaming. Confirm that your channel is verified and that you have no live stream restrictions in the last 90 days. 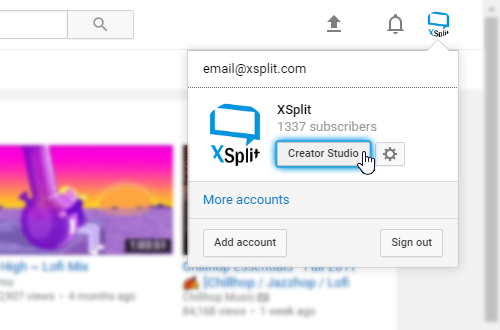 On the Youtube homepage, click on your user photo then Creator Studio. On the Creator Studio sidebar, click on Live Streaming. Go to Broadcast > Set up a new output, then click YouTube. 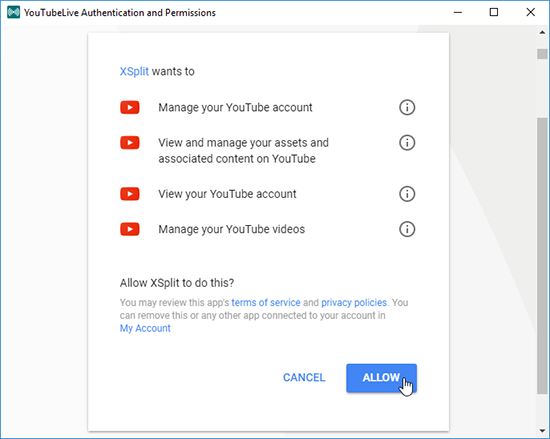 On the Youtube Live Properties window, click Authorize and sign in with your Google account you want to stream to and approve any permissions XSplit is requesting. 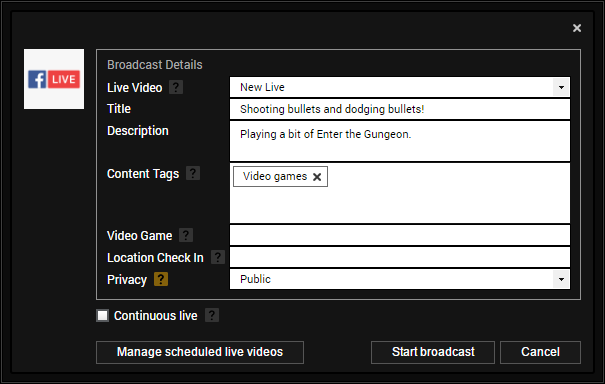 You can either populate the stream details from this window, or enable the Set details before every broadcast option. 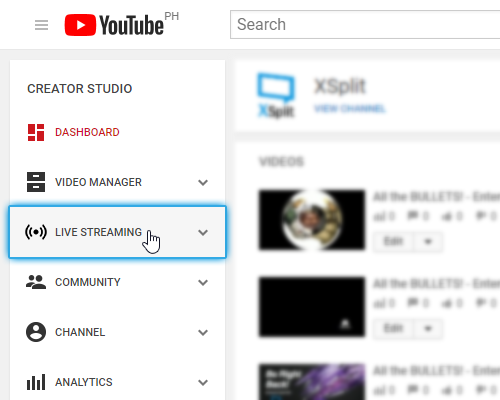 Go to Broadcast and click the YouTube Live profile you have set to go LIVE. You will be prompted to provide stream details whenever you start streaming if `Set details before every broadcast` is enabled in your profile. Go to Broadcast > Set up a new output, then click Mixer. Click Authorize and sign with the Mixer account you want to stream to and then click Next. You will be prompted to Authorize your Mixer account. Click Authorize and sign in to the account you want to stream to and Approve any permissions XSplit is requesting. The Mixer Properties settings will be brought up, if you wish to customize your stream settings. Note that the setup wizard will have automatically set recommended values here already. If you wish to use Mixer's sub-second FTL service, check Use FTL (Beta). Go to Broadcast and click the Mixer profile you have set to go LIVE.